The best football tables for your family home. Browse our extensive range & pick the perfect table. Foosball is a fun, fast family game for all ages. Browse our range of tables to suit all budgets. Commercial football tables feature robust build & coin ops. Designed for bars & clubs, they're always the centre of attention. Our range of folding tables collapse for easy, convenient storage. Ideal for the home with a space shortage, they store away tidily. These tables are the answer for busy homes. Quickly fold away after a game & make the most of your space. The finest football tables from the Continental specialist. Bonzini leads the way in stylish, high-end foosball equipment. Bonzini tables, revered around the world, give superior gameplay, reliability & performance. The full range from the French baby-foot brand, available now. Rene Pierre tables offer the finest in style & performance. Rene Pierre produces football tables from its French workshop. Own a piece of baby-foot history now. Football tables built to live outdoors, in all weathers. Take the beautiful game into the great outdoors. These tables are weatherproofed & suitable for long-term outdoor storage. Ideal for gardens. Our range of tournament-approved ready-to-play tables. Made to ITSF specifications, these are the real thing for tournament players. Built to the correct dimensions for ITSF tournament use, the tables in this section are unparalleled. 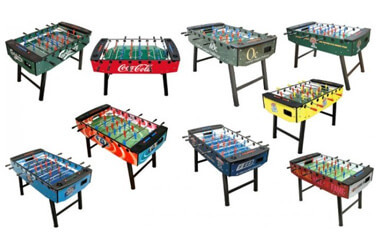 A range of miniature tabletop football tables for office or home. These are small, fun tables with all the excitement of the full-size game! Hold a game in your office, on your desk or in the pub. Or play at home on the dining table or the floor. The best, most exclusive football tables in existence. Built for the luxury home, these tables ooze class & contemporary style. Make a statement in your games room with a spectacular luxury foosball table. Browse the best now. A range of footballs for your table. Various sizes & weights. Spare balls in plastic or cork. Try a new size or weight & improve your game. 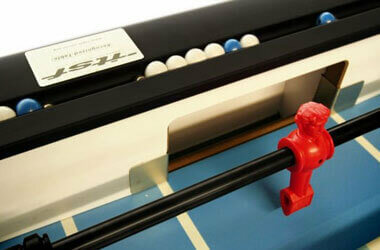 Replacing your table football balls can be the cheapest upgrade. Try cork for increased control & speed. Keep dust, spillages & sunlight off your football table. These covers protect your table, keeping it in A1 condition. Made in a range of materials & sizes, a table cover is ideal to keep your table tip-top & ready to play. Why Buy From Liberty Games? Table football, foosball or baby-foot as it is sometimes referred to, is a popular, fast-paced and fun game for all the family. It has been around in its current form since the 1920s; however the actual game style pre-dates that by many years. For the un-initiated the game is basically a game of soccer on a table! The aim is to score more goals that your opponent. Table football is one of those great games that is very easy to learn and simple to play, but one which takes some time to master. Just as with soccer players there are many different ways to handle the ball to evade your opponent gaining possession and scoring a goal. At Liberty Games we are the biggest foosball retailers in the UK. To make it easier for people who are new to buying these tables we have broken our range down into several categories (see below). We have tables to suit all budgets and space requirements. For those who get really serious, we have ITSF approved tables for sale, this means they have been approved by the International Table Soccer Federation as suitable for match play - which means you will be playing on the same tables you would expect to compete on at, say, the foosball world cup. Generally competition grade tables will have rods which pass through the body of the table rather than ones which collapse inside the table (when moved in and out). This gives greater control over the rod, but in a home environment can mean you have to keep the kids away from the table if they have eyes at rod height. Liberty Games are perfectly positioned to help you choose your next table football table, and all our staff are keen players themselves. So whether you are looking for a home table, one for a bar or club, or even an outdoor table for your garden speak to our friendly team who will be more than happy to help you select the table that is right for you. 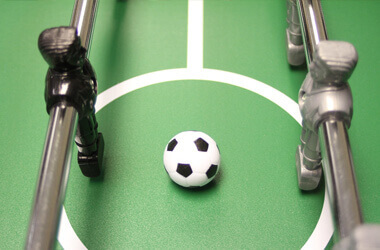 There are a number of factors to keep in mind when looking to purchase a table football table. This guide covers all the main points so you can buy with confidence.